BRIEF DESCRIPTION: The Raoul Wallenberg International Essay Competition, jointly organised by Student Competitions, The Swedish Institute and Raoul Wallenberg’s International Foundation, is inviting all students to take part in an international essay competition. The participants are encouraged to reflect upon Raoul Wallenbergs extraordinary life and come up with creative ideas on how, through their actions, they can inspire acts of courage, tolerance and unselfishness in the world! ELIGIBILITY: The competition is open to all students worldwide ( Bachelor/Master/PhD), between 18-30 years of age. RULES AND REGULATIONS: The participants are encouraged to reflect upon Raoul Wallenbergs extraordinary life and come up with creative ideas on how, through their actions, they can inspire acts of courage, tolerance and unselfishness in the world! PRIZE: Winners of the competition will receive the opportunity to win gift cards worth 1,000, 500 & 250 Euros! Sign up for the competition here by entering your name and email. Reflect on Raoul Wallenberg’s life and share your thoughts on how his qualities and humanitarian spirit have encouraged you to contribute to developmental and humanitarian work. Submit the completed competition application on the competition website by the December 31, 2013 deadline. Save the date, Sunday September 15 at 2:00 pm (pacific) for an online publication event for Ekphrastia Gone Wild. Hear poets from the book read their work on a special Poetry Super Highway Live broadcast right here. 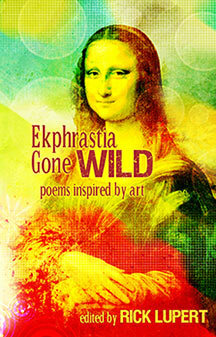 Ain’t Got No Press is thrilled to announce the immediate availability of Ekphrastia Gone Wild: poems inspired by art. This anthology of ekphrastic poetry contains the work of 87 poets from all over the world, including nobel prize winning poet Wislawa Szymborska, Suzanne Lummis, Brendan Constantine, Gerald Locklin, Laurel Ann Bogen, Robert Wynne and many more. Click here to see the full list of contributors and to get your own copy. Head on over to our Facebook page HERE to see the brand (spanking) new cover art for our next anthology “Ekphrastia Gone Wild” which will feature poetry from a roster of 90 poets from all over the world including nobel-prize winner Wislawa Szymborska and more! Thanks to everyone who submitted work for our upcoming anthology “Ekphrastia Gone Wild”. Submissions are now closed. We received work from hundreds of poets and will be spending the next couple of months carefully pouring through them to pull together the best possible anthology we can. We will respond to everyone who submitted so thanks in advance for your patience and stay tuned for more! Ain’t Got No Press is a small-press publisher of uniquely themed poetry anthologies such as “The Night Goes on All Night – Noir Inspired Poetry” and the Jewishly themed “A Poet’s Haggadah – Passover Through the Eyes of Poets.” Please view our submission guidelines for information on submitting work for our upcoming anthologies. honorable mentions receive $100 each. first place and at least $10 to our four honorable mentions.